2) If you want to quick-fry them like I did,remove the entire base of the flower. If you want to bake them, I would still recommend removing the stamen. 3) Dip them in beaten egg, and then dredge them through your favourite flour; I used graham flour (Besan, made from chickpeas / garbanzo beans) for a more rustic taste. Into the flour I tossed a bit of salt and pepper, but you could add whatever spices take your fancy. 4) Fry them is a bit of hot virgin coconut oil (or your preferred oil). Fry them in batches, and keep them warm in a casserole dish in the oven set at about 100°C (200°F). 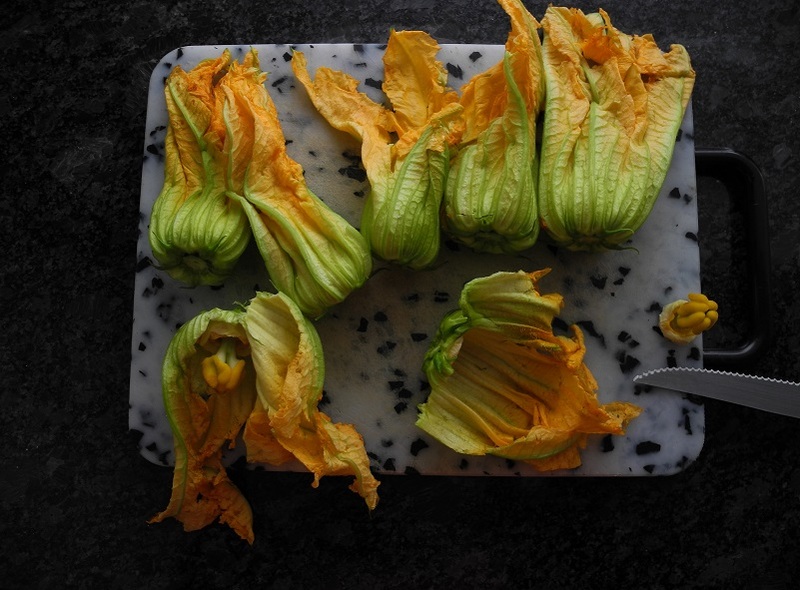 If you have any good recipes for zucchini flowers, let me know please – I’d be interested in trying them! It’s been years since I’ve made traditional meat-based lasagna; currently we eat basically vegetarian because the young woman living with us is vegetarian, and it’s practical and healthy; there are so many great alternatives out there on the market today that meat really isn’t necessary to any dish – it’s just a matter of preference. Here’s my recipe for vegetable lasagna; it can be made with ground beef by the carnivores or ground Quorn by the vegetarians, or with neither… the vegetable mixture is so good that you won’t miss meat! Prepare the vegetables; sauté the onion in a bit of your usual oil – I use either olive oil or coconut oil. Stir in the rest of the ingredients, and cook until the aubergine and zucchini are nearly done. Set aside while you make the sauce. Pre-heat the oven now to 200°C (400°C) and put the oven rack on the lower to middle rungs. Place the sauce mixture in a sauce pan, and with a whisk, whisk in ~1/4 C. milk to a smooth paste. Bring gradually to a boil, stirring constantly and gradually adding milk. The flour in the mixture will thicken gradually. When the sauce has reached a good consistency – a bit thick, not soupy – stir in the grated cheese and remove from the stove. If you feel you’ve not made enough sauce for 2 layers of lasagna, you can add a bit of Ricotta cheese, stirring it in well, to expand the amount of sauce. Spoon 1/2 of the meat(less) mixture into the base of a rectangular oven-proof deep glass dish, spreading to coat the bottom of the dish. 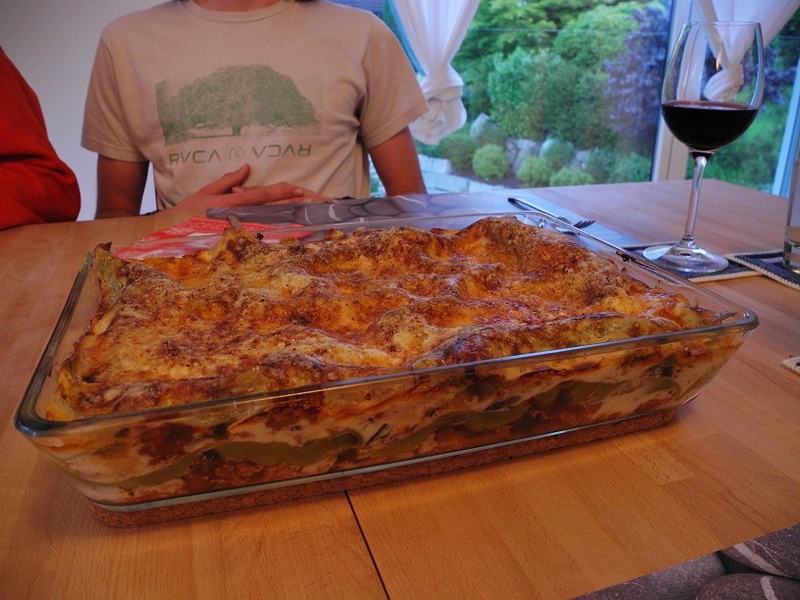 Top with a layer of lasagna noodles (single-layer, not overlapping); spread 1/2 of the bechamel sauce over the noodles, covering all the way to the edges. Repeat these layers once more. Sprinkle the top with grated cheese, and then top with a sprinkle of the breading crumbs. Bake at 200°C (400°F) for ~30-40 minutes, or until the top is golden brown. If you like wine, serve with a red wine such as Pinot Noir for a robust taste, or Chianti for a slightly fruitier addition. Peeling an Entire Head of Garlic in 5 Seconds Flat! If you’ve ever had to peel a head of garlic, it can take awhile. For one clove I’ve found that the best method for me is to snip off the root-end of the clove, lay it flat on your cutting board, and with a large knife flat across it, whack the knife with the heel of your hand. Whala. But an entire head? Here’s an ingenious way! Just click on the image below. Thanks to friend and chef Paul Coffey(great name for a chef, ey?) for this tip! This was recently made, and delicious! I will be the first to admit that I am usually too lazy to make my own pasta – living next door to Italy means we have both dried and fresh versions in every grocery store. Having said that, I have made this occasionally and what can I say? Home-made is the best! In the picture you’ll notice two colours of pasta; we substituted a bit of the spinach for some of the flour in the basic dough recipe; experiment and see how much you’ll need, and add a bit of flour to compensate for the extra moisture if needed. Mix into a smooth dough; tip out onto a floured surface and knead with your hands until it is smooth and elastic. Return to the bowl, cover and let it rest for 30-60 minutes. Thaw the spinach, press the extra liquid from it, and chop if it’s not already chopped. Mix everything together. Halve the dough; set aside half. On a bit of flour, roll out the half dough into a thin rectangle (~32×46 cm), loosening it occasionally from the work surface. With a dough cutter (pizza cutter or a knife), trim the edges to straighten. About 4 cm from the edge of the dough, about 2 finger-widths apart, spoon ~1 tsp. Across ONE row only, covering the rest of the dough with plastic to keep it from drying out. With a bit of water on your finger, moisten a strip of dough between each filling mound and along the outer edges. Fold the dough from the edge up and over the filling, pressing down on the outer edges and between each mound. With a dough wheel, or butter knife, cut the dough free from the rest of the dough, and slice between each ravioli, pressing together firmly if still needed. Spread the finished ravioli on a plate to dry while you prepare the others. In simmering, salted water, simmer the pasta for 5-7 minutes (avoid boiling, as it will burst the ravioli). If you want to cook all 60 ravioli at once, use a wide, deep pan. If you do it in batches, then place the cooked pasta, drizzled with a bit of melted butter, into an oven-safe pan with a lid, and keep it warm in a low-heated oven (50-100°C / 120-200°F). Serve with your favourite pasta sauce, and grated cheese. Serve with a robust red wine, for example a somewhat buttery Chardonnay or a full-bodied Pinot Gris. Fleshy, aromatic whites with a hint of fruit and oak are well suited to this dish. Thanks to The Wine Review for this tip!